Hispanic Lifestyle was invited to the premiere of Disney’s California Adventure newest attraction Guardians of the Galaxy – Mission: BREAKOUT! About the new attraction, Guests become the protagonists of a rockin’ new adventure in Disney California Adventure Park as they help rescue a cosmic gang of misfits in Guardians of the Galaxy – Mission: BREAKOUT! This thrilling attraction is fueled with high-energy, hilarious action that will be fun for Super Hero fans and those who are discovering this story for the first time. Guardians of the Galaxy – Mission: BREAKOUT! entices guests with an original storyline based on “Guardians of the Galaxy” films, comics and animated television series, with a rapid rise into chaotic adventure and surprising visuals. The fast-paced action rocks to the beat of music inspired by the films’ soundtracks, including classic rock and pop music from the ‘60s, ‘70s and early ‘80s. And with multiple ride profiles, guests never know which adventure they’ll get.“Guardians of the Galaxy – Mission: BREAKOUT! 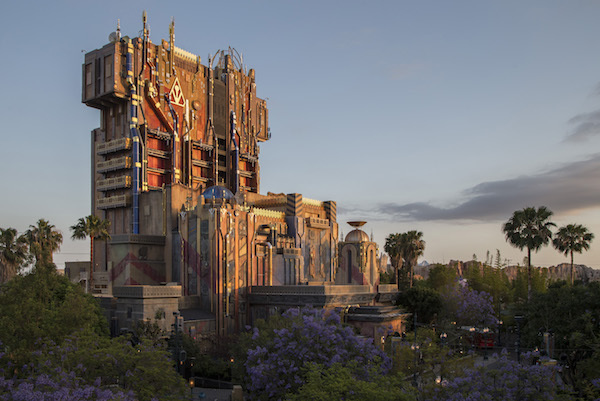 brings an all-new epic adventure to the Disneyland Resort, and it’s the only Disney park in the universe where guests can step into a Guardians of the Galaxy story,” said Bob Chapek, chairman of Walt Disney Parks and Resorts. “Like the smash-hit films that inspired it, this new attraction is action-packed, full of irreverent humor, and features an ‘awesome mix tape.’ It’s a fantastic way for guests to experience the Super Hero universe like never before.”Guardians of the Galaxy – Mission: BREAKOUT! opens just weeks after the theatre premiere of the new film, “Guardians of the Galaxy, Vol. 2.” The stars of the films are featured in the attraction.Walt Disney Imagineering collaborated with James Gunn, director of the “Guardians of the Galaxy” films, Kevin Feige, president of Marvel Studios, most of the main talent from the films along with Joe Quesada, chief creative officer, Marvel Entertainment, and Marvel Themed Entertainment on the story of the attraction, to develop an experience where guests step into a story with these characters for the first time. The Guardians of the Galaxy – Mission: BREAKOUT! adventure begins as guests enter a grandiose, 183-foot tall fortress. They discover that the Guardians have been imprisoned by the arrogant, acquisitive Taneleer Tivan, known as The Collector. Guests join a daring escape plan devised by Rocket, who once again proves his uncanny ability to break free from any prison or captivity.The dominating fortress is adorned with antennae, satellite dishes and other mysterious apparatus and is accented in shimmering hues of blue and gold. At night, with special lighting, it pulsates with imposing power. A gilded, eight-foot-tall statue of The Collector stands at the entrance to the fortress, towering over guests. These VIP guests of The Collector enter to view the unique “Tivan Collection” of relics and species from all over the universe. His latest acquisition: The Guardians of the Galaxy. Before leaving the Lobby and entering The Collector’s Office, guests hold up their hands to be “bio-scanned” for security clearance. In the Office, even more of The Collector’s relics are on display and, as in the Lobby, the collection contains some hidden references that will delight dedicated Super Hero fans and Disney fans.Suddenly, Rocket appears, telling guests he needs their help. Using their security clearances, he can hijack the gantry lift to the top of the fortress, disable the generator, and free his friends. To help create the attraction, Disney Imagineers used Virtual Reality technology to pre-visualize the Tivan Collection, the Collector’s Office and other parts of the Guardians of the Galaxy – Mission: BREAKOUT! experience.The ride system has more high-speed ride time than ever before, and the thrill factor gets going as soon as the gantry lift doors close and the music stars blaring. Each song is accompanied by a different up-and-down ride profile and story scenes, making every visit to the attraction unpredictable.Rocket makes multiple appearances in the attraction, including as a sophisticated Audio- Animatronics character who invades The Collector’s Office to ask guests for a hand with his escape plan.From the anticipation guests will feel as they enter The Collector’s Fortress to the sense of discovery as they tour the Tivan Collection to the thrills and elation of participating in a successful breakout, Guardians of the Galaxy – Mission: BREAKOUT! is an unforgettable adventure into the Super Hero universe at Disney California Adventure.